On November 4 students from around the county put on the play “I Never Saw Another Butterfly” at Muskegon Community College Overbrook Theater. It was directed by Lynn Frisinger and Anna Alpert. The project raised funds to support “Gilana’s Fund”. More information can be found at www.gilanasfund.org. Our program year 2017-2018 began with the day called Kristallnacht, November 9 and 10, 1938, and featured our guest, Rick Baumann who is an editor for the Huffington Post. He told the story of his grandparents and their struggle to leave Germany and failing to do that, survived under the Nazis. Our second event marked “International Holocaust Commemoration Day” which January 27th. Our guest was Carl Wilkens, who was in Rwanda in 1994 when the genocide led by Hutus slaughtered 800,000 or more people who were Tutsis. The film “I’m Not Leaving” was shown twice and after each presentation Carl was present to talk with the attendees. Looking to the future . . . The commemoration events for the year 2019 will be March 24-27. The commemoration events for the year 2020 will be March 29-31. This year will make the 75th Anniversary of the end of the war in Europe and the liberation of the death camp, Auschwitz-Birkenau and the concentration camps and labor camps in Germany and Austria. And a new look is coming. The logo for the Center for Holocaust and Genocide Studies was first used in 1995. The design incorporates two symbols of the Jewish and Christian communities: the fish and lamp. 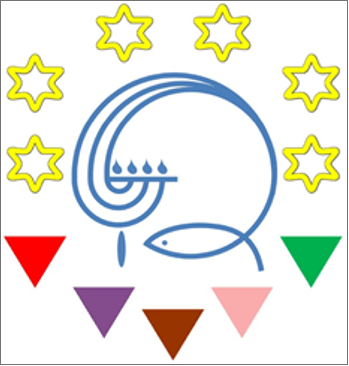 We used this logo of what was the National Conference of Christians and Jews and added to it the six stars of David and the triangles in the various colors identifying those the Nazis considered undesirables. As the Shoah Remembrance Committee of Muskegon grew into the Center for Holocaust and Genocide Studies and involved of wider audience in terms of leadership and support, it was felt the logo needed to grow with the times. We wanted the symbol to express Commemoration, Education and Reflection. The new logo will come the end of summer. The CHGS Board meeting will be June 20th. This is a planning meeting to look at goals and events. Copyright © 2019 Center for Holocaust and Genocide Studies. All rights reserved.